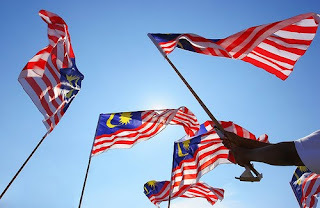 Ulat Buku Geek: Happy 53rd Indepence Day, MALAYSIA! Malaysia, Truly Asia (yep,that's the motto). I love my country, and I love everything about it even though sometimes what I hate most is that no AUTHORS come here for book signings and or we get the latest released books 6 months late. lol. But the best thing about Malaysia, we are multiracial, Malay, Chinese, Indians, Ibanese, Dusun, Kadazan and the list could go on. But we are one as Malaysians. It's nothing special, really, but hey, who doesn't love their country, right? But I need to ask, honestly, have you ever heard a country called Malaysia? Have you ever been in Malaysia? Just curious. LOL. Just now, I read Alice's post, fellow and good friend of Malaysian book blogger on 10 things to love about Malaysians. I wouldn't describe it better in any either way! Awww happy independence day! I hope you have some awesome festivities in your country's honour today! Yah! How cool. Happy independence day! Happy Independence Day! I haven't been to Malaysia but I've definitely heard of it! Selamat Hari Merdeka Darlyn!!! We're are really fortunate to be born in this country, Malaysia. I Love Malaysia. Cheers, any special independance day traditions? Why when so much is made about the USA's Independence Day did I not even know that today was Malaysia's? Have a great day. Happy belated Independence day and yes I have heard of Malaysia. Unfortunately I don't know too much about it, but I'll go do some researching right now. I'm late! Happy Merdeka, Darlyn! And before long, Selamat Hari Raya! Thanks for the mention. :) Malaysia is truly a great country.